Organizations are facing ever-stiffer competition in the current globalized economy, and employees are consequently being exposed to increasingly adverse psychosocial work factors. Psychosocial work factors, also called psychosocial stressors, refer to all organizational factors and interpersonal relationships in the workplace that may affect workers' health. Two well-defined and internationally recognized theoretical models are used to assess these factors: the Karasek demand-latitude-support model and the Siegrist effort-reward imbalance model. The Karasek and Siegrist models reflect specific components of the work environment for which there is empirical evidence of a deleterious effect on health. Preventive interventions targeting these factors are conducted in workplaces. However, few studies have rigorously documented these interventions and their effectiveness in reducing adverse work factors and improving health outcomes. Most previous intervention studies were limited by (1) a short follow-up that may not have provided sufficient time for effects to appear, (2) small sample sizes (N ≤ 100) that limited the statistical power and the possibility of detecting results and (3) rare assessment of the Siegrist model. The current paper presents the overall design and the main results of an intervention study on psychosocial work factors and related mental health and musculoskeletal outcomes. The study integrated (1) a development phase that aimed at identifying the changes needed to reduce psychosocial factors in the target population and the best ways to bring about these changes, (2) an implementation phase that systematically documented how the intervention was carried out and (3) an effectiveness phase that evaluated whether the intervention was successful in reducing adverse psychosocial work factors and health problems. In addition, the study used repeated measurements of psychosocial work factors and health indicators at baseline and six and 30 months post-intervention to assess short- and medium-term effects of the intervention. In industrialized working populations, musculoskeletal disorders and mental health problems constitute two of the most common, costly and debilitating health problems (Daveluy et al. 2000; Honkonen et al. 2007; Järvisalo et al. 2005; National Institute of Mental Health 2008; National Research Council and Institute of Medicine 2001; Sanderson and Andrews 2006). Musculoskeletal disorders, including arthritis, constitute the most common chronic condition (Lawrence et al. 1998) and one of the leading causes of activity limitations (National Center for Health Statistics 2007). Musculoskeletal disorders and mental health problems have reached alarming prevalence and constitute the two main motives of work absence for a certified medical condition, causing considerable loss of productivity for employers (Bourbonnais et al. 2005; Karttunen 1995; Niedhammer et al. 1998; Vézina et al. 2006; Vinet 2004). Many adults in industrialized countries spend over half of their waking time at work (Bureau of Labor Statistics 2009; Parent-Thirion et al. 2007). Recent changes in the labour market conditions, such as increased competitiveness and workload and decreased job security, contribute to an increase in the prevalence of adverse psychosocial work factors (Aronsson 1999; Parent-Thirion et al. 2007; Statistics Canada 2005). These adverse psychosocial factors have been shown to contribute to the development of chronic health problems (Belkic, Landsbergis, Schnall, and Baker, 2004; Bongers et al. 2006; Stansfeld and Candy 2006). Two major theoretical models are used to assess the impact of psychosocial work factors on health: the Karasek job strain model (Karasek 1979) (Figure 1) and the Siegrist effort-reward imbalance (ERI) model (Siegrist 1996) (Figure 2). 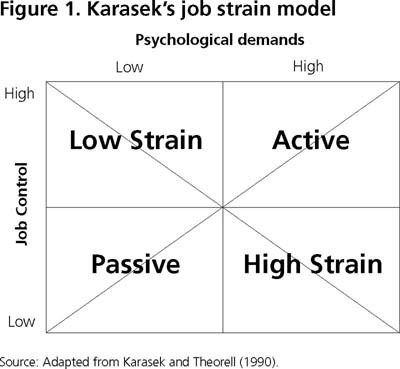 The two-dimensional Karasek job strain model suggests that workers simultaneously experiencing high psychological demands (PD) and low decision latitude (DL) are more likely to develop stress-related health problems (Karasek 1979). PD refer to an excessive workload, very hard or very fast work, task interruption, intense concentration and conflicting demands. DL is a combination of skill discretion (learning new things, opportunities to develop skills, creativity, variety of activities, non-repetitive work) and decision authority (taking part in decisions affecting oneself, making one's own decisions, having a say on the job and having freedom as to how the work is accomplished). Poor social support (SS), as indicated by a lack of help and co-operation from supervisors and co-workers, was introduced by Johnson et al. (1989) as a third component of the job strain model. The Siegrist ERI model (1996) proposes that extrinsic efforts (e.g., constant time pressure, many interruptions and disturbances, lot of responsibility, pressure to work overtime) should be rewarded in various ways: income, respect and esteem and occupational status control (job security, promotion prospects and unforced job change). Workers are in a state of detrimental imbalance when high extrinsic efforts are accompanied by low rewards and are thus more susceptible to health problems. Follow-up time was not long enough to allow the effects of the intervention to occur. Indeed, most recent studies evaluated the effects on health outcomes one year or less after the implementation of the intervention (Anderzen and Arnetz 2005; Berkhout et al. 2004; Bond and Bunce 2001; Bourbonnais et al. 2006; Eklof and Hagberg 2006; Fredriksson et al. 2001; Jackson and Mallarky 2000; Kawakami et al. 2005; Michie et al. 2004; Mikkelsen and Gundersen 2003; Mikkelsen et al. 2000; Park et al. 2004; Parker 2003; Ryan et al. 2005; Sluiter et al. 2005; Theorell et al. 2001; Wahlstedt et al. 2000). An appropriate follow-up requires that sufficient time elapse since the implementation of the intervention to produce a meaningful decrease in adverse work factors and consequent improvement in health outcomes. While a reduction of adverse work factors could occur over some months, related improvements in health outcomes will take longer. However, little is known on these time-related issues. A number of previous studies had small intervention groups, that is, 100 or fewer workers, which limited the statistical power and the possibility of detecting differences in outcomes between intervention groups (Bond and Bunce 2001; Bourbonnais et al. 2006; Fredriksson et al. 2001; Kauffeld et al. 2004; Kawakami et al. 2005; Mikkelsen and Gundersen 2003; Sluiter et al. 2005; Wahlstedt et al. 2000). Only three studies assessed the psychosocial work factors defined in Siegrist's model (Aust et al. 1997; Bourbonnais et al. 2006; Lavoie-Tremblay et al. 2004). A three-phase framework was proposed by Goldenhar and colleagues (2001) to conduct rigorous intervention research. Each phase aims to answer complementary questions through corresponding quantitative and qualitative methods (Figure 3). The goal of the first phase, development, is to determine what theories apply to a specific situation, what changes are needed to improve the health of the targeted population and how can these changes be optimally implemented. The second phase, implementation, aims at systematically documenting how an intervention is carried out. The last phase, effectiveness, evaluates whether the intervention was successful in reducing the prevalence of psychosocial work factors and health problems. 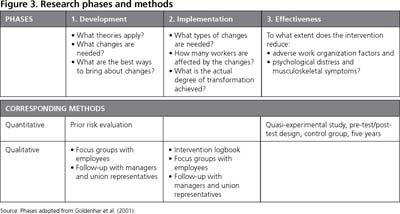 Few intervention studies on work organization and health have addressed these three phases. This paper presents the overall design and the main results of a study evaluating an intervention that aimed at reducing four well-documented psychosocial work factors (high PD, low DL, low SS and low reward) and their effects on two health indicators (psychological distress and musculoskeletal symptoms) using the three-phase framework. The research design of the current study has been described elsewhere (Brisson et al. 2006). Most parts of this section are adapted from the previous paper. The participating organization employed, at baseline, a total of 1,659 white-collar workers aged 18–65 years old, and was followed up for seven years (Brisson et al. 2001). At baseline, a total of 1,330 workers (826 women and 504 men) participated, representing 80.2% of all employees. More than half (53.6%) were 40 years or older. They were generally well educated (40% had a university degree, and 30% had a junior college degree). Their jobs encompassed the full range of white-collar positions, including senior and middle managers (5%), professionals (i.e., social worker, actuary, lawyer) (38%) and technicians (i.e., indemnity agent, inspector, computer analyst) and office workers (i.e., telephonist, receptionist, secretary) (57%). Their main activities were planning and providing insurance services to the general population. The organization was structured in six branches according to different functions (e.g., administration and finance, client services), which were further subdivided into 12 departments. Because the intervention targeted the entire organization, all employees were invited to participate in each measurement time, even if they did not participate in the preceding measurement(s). Therefore, the intervention had a repeated cross-sectional design in which employees participated in zero, one, two or three data collections. The participation rate and participant characteristics were similar at baseline and follow-ups. At the first follow-up, six months after the intervention, 1,723 employees (1,099 women and 624 men) participated. At the second follow-up, 30 months after the intervention, 1,569 employees (983 women and 586 men) participated. (1) reached a large percentage of employees in the department and (2) brought about a genuine transformation in the work environment from the point of view of the key informants of the organization. Examples of these major changes are given in Table 1. Figure 4 presents the intervention period and the pre- and post-intervention measurements. Data collection was conducted in the workplace. Employees were contacted by phone and provided with information regarding the study. An appointment was scheduled with those who agreed to participate. All participants signed a consent form that provided information about the study; they were free to withdraw at any time. Each of them received a personal health report following data collection. Department results were presented following every phase of the study. The project was approved by the Research Ethics Committee of Laval University. At baseline and the six- and 30-month post-interventions, participants completed a self-administered questionnaire on demographic characteristics, psychological distress, musculoskeletal symptoms, cardiovascular disease risk factors, characteristics of work environment and characteristics of social life Trained staff measured participants' weight, height and waist circumference. PD, DL (measured with nine items each) and SS from colleagues and supervisor (measured with six and five items, respectively) were evaluated using the French version of the Karasek Job Content Questionnaire. The psychometric qualities of this version have been demonstrated (Larocque et al. 1998). PD and DL were dichotomized at the median that was observed in a random sample of all Quebec workers (Santé Québec 1989). Most previous studies of these factors have used a median cut-off (Belkic et al. 2004). The quadrant method (Karasek 1979) was used to assess the exposure to PD and DL (job strain, active, passive and low strain). Scores of SS were divided into tertiles. Reward was evaluated using the French version of the 11 original items recommended by Siegrist (2003). These items were divided into three scales assessing esteem (five items), promotions and salary (four items) and job security (two items). The factorial validity and internal consistency of both the English and French versions have been demonstrated (Niedhammer 2002; Siegrist 2003). Effort was measured with two original items of the French version of the Siegrist questionnaire ("over the past few years, my job has become more and more demanding" and "I am regularly forced to work overtime") and with two proxies ("my tasks are often interrupted before they can be completed, requiring attention at a later time" and "I have enough time to do my work") (Cronbach's a = .69). The effort-to-reward ratio was calculated and divided into tertiles (Niedhammer et al. 2000). Psychological distress was evaluated with the Psychiatric Symptoms Index (PSI; Ilfeld 1976), a 14-item validated index that measures depression (six items), anxiety (four items), cognitive disturbances (two items) and anger (two items) during the previous week on a scale ranging from one (never) to four (very often) (Préville et al. 1992). The PSI-14 has shown good concomitant validity with four other indicators of mental health: consulting a health professional for a mental health problem, being hospitalized for this type of problem, having suicidal thoughts or attempting suicide and consuming a psychotropic medication (Préville et al. 1992). A total score for psychological distress was calculated from the answers to the 14 items. Participants with a total score ≥26.19, which represents the lower limit of the highest quintile observed in a general population sample (Daveluy et al. 2000), were considered prevalent cases of psychological distress. Musculoskeletal symptoms were evaluated for three body regions: shoulder and neck, lower back and upper limbs. Upper limbs included symptoms at forearms, wrists and hands. A modified version of the Nordic questionnaire was used to measure musculoskeletal symptoms (Kuorinka et al. 1987). Prevalent cases were defined by musculoskeletal pain, ache or discomfort in the past six months (answered by yes or no) with related functional limitations at work, at home or in leisure activities. Functional limitations were investigated by the following question: "Did you have to decrease your activities because of your musculoskeletal symptoms?" and were measured by a yes or no answer for each of the three activity categories. Pre-shaded manikins were used to help subjects identify the correct body region (Pope et al. 1997). Student t test and Χ2 analyses were used to compare baseline and follow-up characteristics among participants. Logistic regression models were performed to compare the intervention group and the reference populations at baseline. Generalized estimating equations (GEEs) were used to assess pre-intervention and six- and 30-month post-intervention evaluations. GEEs constitute an appropriate statistical model for correlated repeated measures (Zeger and Liang 1986). Potential confounders were included as adjustment variables in the final model when they introduced a change of more than 10% in effect estimates. SAS 9.1 software (33) was used to perform all analyses. In the current paper, specific results from one major department are presented to illustrate the development phase. This department (department A) was composed of 146 office employees (28 men and 118 women) whose work consisted of answering and following-up client requests in accordance with pre-established rules. Although the sample results presented here are specific to department A, the same methodology was used in the other departments. The prior risk evaluation consisted in a systematic assessment of the prevalence of the four psychosocial work factors and of psychological distress. This assessment aimed at identifying which groups were at higher risk within the organization. However, there are unique challenges in prior risk evaluation. Research on chemical and physical hazards typically allows the specification of exposure standards to control potential sources of illness. Comparable thresholds are not available for psychosocial work factors. It is therefore difficult to determine what levels of exposure to psychosocial work factors should be considered harmful and warrant prevention efforts. 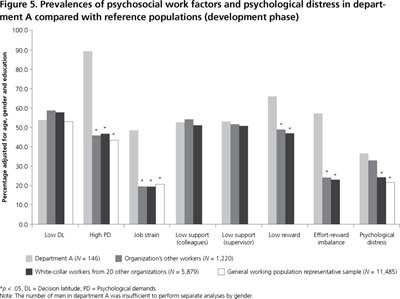 The approach used in this study draws on benchmarking practices to compare the psychosocial work environment in the study organization with two reference populations, thus providing a "barometer" of the extent of adverse psychosocial work factors within the organization. To this end, for each department, the prevalences of psychosocial work factors and health indicators were compared with those of two external reference populations and with the prevalence of the organization's other workers. In each department, psychosocial work factors whose prevalence were found to be greater than that observed in at least one of the reference populations were identified as targets for preventive interventions. The first reference population was made up of 11,485 workers who constituted a representative sample of the general Quebec working population. 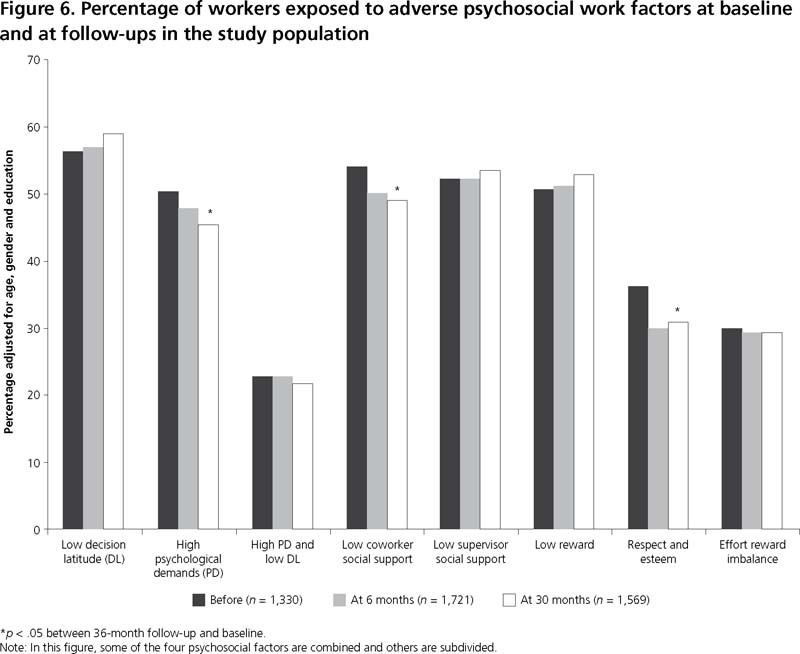 The comparison with this population allowed us to determine if the prevalences of psychosocial factors and psychological distress were higher in the study population than in Quebec workers. The other reference population was composed of 5,879 workers employed in 20 other white-collar institutions that participated in a cardiovascular health follow-up study conducted by our team in 2001 (Brisson et al. 2000). These comparisons allowed us to determine if the prevalence figures of the psychosocial factors and psychological distress were greater than those of white-collar workers employed in comparable institutions. 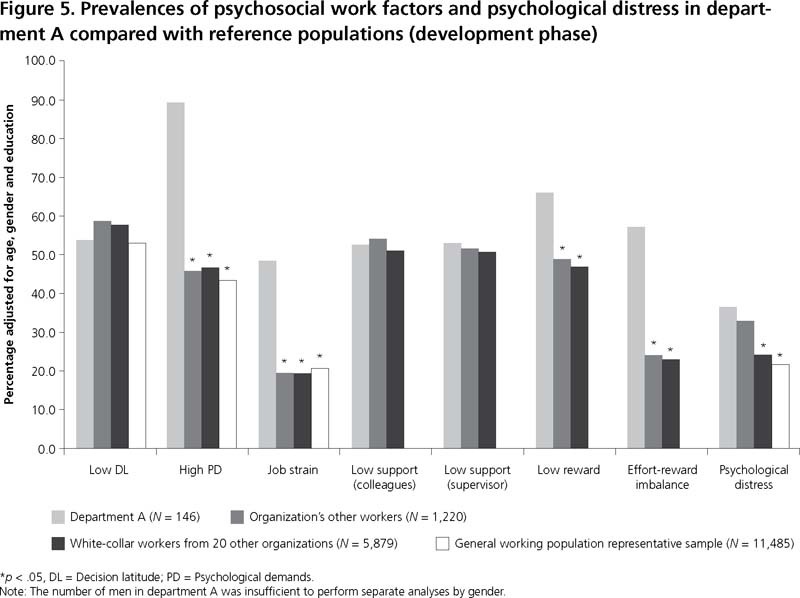 In department A, the prevalences of all four psychosocial work factors (high PD, low DL, low SS and low reward) and of psychological distress were significantly higher than in the reference populations (Figure 5). Specifically, the prevalence figures observed in department A for high PD, job strain and effort-reward imbalance (89.3%, 48.4% and 57.1%, respectively) were more than twice as high as those observed in at least one of the reference populations. The prevalence of low reward was also high (66% compared with approximately 48% in the reference populations). Psychological distress was higher in department A (36.5%) than in the rest of the organization (32.7%) and the other reference populations (23%). During the development phase, focus groups were held in each branch or department targeted for intervention in order to obtain a more in-depth understanding of the main problems identified through the prior risk evaluation. Each focus group was led by two investigators and composed of eight to 14 workers who had accepted the invitation to participate. For the first meeting, the discussion was taped and subsequently transcribed verbatim. A detailed content analysis (L'Écuyer 1987, 1990) was performed to identify themes and subthemes expressed by the participants and related to psychosocial work factors. A report was produced and validated by the participants in a second meeting. The goal of a third focus group meeting, involving the same participants, was to establish five priorities for intervention using the nominal group technique (Ouellet 1987). It is important to note that these priorities sought to solve problems identified during the prior risk evaluation by all employees of each department. This technique requires participants to answer one question individually before sharing their ideas with the group and building consensus on five priorities through a voting procedure. The question was, "What things should be changed to improve work organization?" The priorities established were suggested to the managers, who then had to decide to implement them or not. These suggestions did not constitute an exhaustive list of all changes undertaken as part of the intervention. (3) put a temporary hold on work organization changes, (4) implement quality control and (5) consult employees about work organization changes. The first three priorities were related to PD and the last two to reward. The implementation phase systematically documented how the intervention was carried out. The implementation of the intervention was monitored primarily with qualitative research tools: an intervention logbook and focus groups with employees. As with the development phase, specific results from department A are presented to illustrate the implementation phase. (1) a description of the activity, (2) the goal (or problem targeted), (3) the administrative unit involved, (4) the date or period of the activity, (5) the number of employees involved, (6) the work organization factor(s) targeted and (7) the degree of improvement expected from the activity (weak, medium or strong). The intervention logbooks were submitted to the president of the organization as well as to the research team. In two departments, logbooks were also submitted to the local work organization committee, which was composed of union and management representatives. Each logbook was updated twice. A qualitative analysis of the recorded activities provided a description of the nature and intensity of the changes implemented as part of the intervention. As a first step, the numerous activities recorded in the logbooks were categorized into specific types of activities (e.g., training, restructuring, social events etc.). Focusing solely on frequency may be misleading, as certain activities may have a stronger impact than others. For this reason, the second step of the analysis consisted of identifying major changes in collaboration with the key informants of the organization. The intensity of the changes was assessed based on an evaluation of the number of employees exposed to the change and the actual degree of transformation achieved. The department A logbook described 48 activities that were implemented as part of the intervention. High PD and low reward were targeted by 35% and 54% of the activities, respectively. Table 2 shows the changes implemented in department A according to both the logbook and a fourth focus group (see below). The implementation phase was also monitored through a fourth focus group meeting conducted with the same participants. The aim of the meeting was to identify the changes introduced in the work organization during the intervention period and to determine whether or not those changes actually reduced adverse psychosocial work factors from the employees' point of view. In addition, the meeting allowed researchers to assess the participants' satisfaction with the focus group process and its contribution to the intervention. The increase in the workforce was assessed positively, but its effects were moderated by an ever-increasing workload. The arrival of support staff helped to decrease the workload, but this change was perceived as a temporary solution. Organizational restructuring and changes in the management team were evaluated positively in terms of collaboration and management concern for the employees' needs. New projects that had been implemented had pros and cons. Compressed schedules were offered to employees but with no concomitant adjustments to the workload; these schedules resulted in an increased work tempo. Reactions to the focus groups were generally positive: participants felt that they could express their views on organizational problems honestly, that their opinions were respected by the researchers and that confidentiality would be maintained. However, participants felt that feedback from management was lacking with regard to the focus group reports and which solutions were retained for intervention. The last phase, effectiveness, measured the extent to which the intervention was successful in improving psychosocial work factors and health outcomes. Baseline data used for the prior risk assessment constituted the pre-intervention measure. As shown in Figure 4, the intervention period took place during the second and third years of the study. Post-intervention measures were collected at six and 30 months after the mid-point of the intervention period. Results are presented here for the entire study population to present the global portrait. 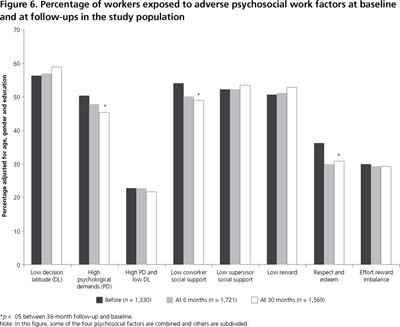 During the 30-month follow-up, the prevalence of three psychosocial work factors significantly decreased (Figure 6): high PD decreased from 50.1% to 45.4%, low co-worker SS dropped from 53.9% to 48.9% and low reward, as shown by a lack of respect and esteem, decreased from 36.1% to 30.9%. No significant changes were observed for low DL. All health indicators improved significantly during follow-up (Figure 7). The prevalence of high psychological distress (workers in the highest quintile of psychological distress) decreased from 34.1% to 27.8%. As well, the prevalence of workers with low back symptoms or neck and shoulder symptoms decreased, respectively, from 58% to 52% and from 67.7% to 60.4%. For both health indicators, effects observed at six months were maintained 30 months after the intervention. For psychological distress, the effect was not only maintained but intensified at 30 months. The development phase set intervention targets through a quantitative prior risk assessment and focus group meetings with employees. In department A, the prior risk assessment showed that the prevalence of all four psychosocial work factors (high PD, low DL, low SS and low reward) was greater than in the reference populations. Focus groups with employees confirmed that their work involved high PD and low reward. Five action priorities were established. Three of them were suggested to improve PD, and the other two to improve reward. The implementation phase documented the intervention with logbooks and assessed, through focus groups, whether or not the intervention was actually carried out and reached the employees (Kristensen 2005). The department A logbook described 48 activities that were implemented as part of the intervention. High PD and low reward were targeted by 35% and 54% of the activities, respectively. During focus group with employees, six activities introduced in the workplace were discussed. Two of them were perceived as beneficial for reward. Two others were perceived as moderately beneficial (pros and cons) for PD, another as having a temporary positive effect and the last as detrimental. Results of the effectiveness phase were presented for the entire study population. These results showed an improvement in three of the four psychosocial work factors (high PD, low co-workers SS and low reward). These results are consistent with those of previous prospective intervention studies that observed an improvement in at least one psychosocial work factor (Anderzen and Arnetz 2005; Bourbonnais et al. 2006; Kauffeld et al. 2004; Logan and Ganster 2005; Mikkelsen and Gundersen 2003; Mikkelsen et al. 2000; Sluiter et al. 2005; Theorell et al. 2001; Wahlstedt et al. 2000). It is noteworthy that, in our study, only the respect and esteem dimension of reward improved. This result might be explained by the fact that the participating organization did not have much control over the other two dimensions of reward (income and occupational status control) since it must comply with strict rules imposed on all public organizations in Quebec. Health indicators also improved. The prevalence of high psychological distress significantly decreased. This result is consistent with those of four recent intervention studies. These studies observed short-term (12 months) effects (Bond and Bunce 2001; Mikkelsen and Gundersen 2003; Sluiter et al. 2005) or the start of a beneficial change process (Mikkelsen et al. 2000). However, two previous prospective studies observed an increase in emotional exhaustion after the intervention (Dahl-Jorgensen and Saksvik 2005; Ryan et al. 2005) and two others observed no effect (Kawakami et al. 2005; Logan and Ganster 2005). The studies that observed no effect had small sample sizes, which limited the statistical power and the possibility of detecting important differences between groups. The effectiveness phase also showed that the prevalence of low back and neck and shoulder symptoms significantly decreased during follow-up. Only two other intervention studies have measured musculoskeletal symptoms (Eklof and Hagberg 2006; Wahlstedt et al. 2000), and these observed no effect. These studies were limited by a short follow-up (one and six months), which might not have been long enough for the intervention to produce a beneficial effect. The Wahlstedt et al. study (2000) was also limited by a small sample size (N = 82). In terms of public health, the results of the effectiveness phase could be substantial. Indeed, there is empirical evidence of a deleterious effect of the four adverse psychosocial work factors targeted on mental health and musculoskeletal indicators (Bongers et al. 2006; Stansfeld and Candy 2006). Furthermore, simultaneous improvements of small magnitude on several psychosocial work factors could result in significant improvements in health-related indicators. In this study, three of the four psychosocial factors simultaneous improved by about 5%. Likewise, the prevalence of three health indicators significantly improved by 6–7%, which means an improvement for approximately 100 workers for each indicator in our study population. It is also interesting to mention that, in industrialized working populations, musculoskeletal symptoms and mental health problems are among the primary causes of work leave due to sickness (Bourbonnais et al. 2005; Karttunen 1995; Vézina et al. 2006; Vinet 2004). Since a day of absence costs up to 1.5–2 times the day's salary for the worker, a reduction in the prevalence of these health issues may have an important economic impact (Brun and Lamarche 2006). An upcoming paper will report the measured effect of the intervention on sickness leaves. The current study had several strengths: (1) a rigorous design composed of three phases with a pre- and post-test evaluation; (2) the use of both qualitative and quantitative approaches; (3) high participation rates at baseline and at the six- and 30-month follow-ups, limiting the likelihood of selection bias; and (4) the use of validated instruments to assess psychosocial work factors and health indicators. It also met two necessary conditions for a successful intervention study: the involvement of top and middle management and the use of employee knowledge and participation (Kompier and Kristensen 2000; Kompier et al. 1998). There were other specific strengths regarding each of the three phases. The development phase allowed the gathering of crucial background information to characterize the problems and to target adverse psychosocial work factors. The results of this prior risk evaluation provided a sound basis for managers and union representatives to enhance their understanding of the nature and extent of the initial problems. A specific strength of the implementation phase consisted in its systematic noting of the activities introduced in the workplace in order to improve psychosocial work factors. It is noteworthy that this type of multiple-component intervention makes it more difficult to identify which intervention component(s) is responsible for the effects measured. 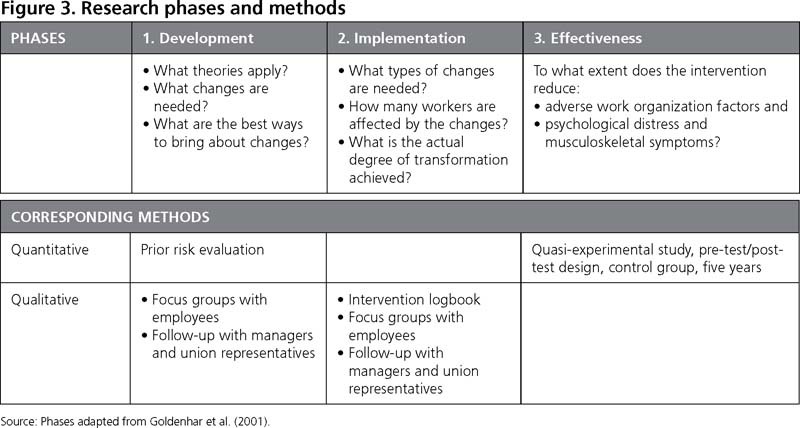 However, systematic reviews of ergonomic studies evaluating biomechanical and work organization interventions have shown that multiple-component interventions have greater effectiveness (Karsh et al. 2001; Silverstein and Clark 2004). The underlying mechanism is that psychosocial work factors take multiple forms in concrete work situations, and these multiple forms can only be tackled by making several appropriate changes in work situations (Denis et al. 2008; Karsh et al. 2001). In another paper (in preparation), a complete and thorough description and analysis of these components will be provided. This will help with interpreting the effectiveness evaluation. Another strength of the implementation phase involved providing managers with employee feedback on the implemented changes, feedback that could be used to further improve the intervention. A final study strength is that the effectiveness phase made it possible to evaluate the short-term (six months) and medium-term (30 months) impacts on psychosocial factors and health indicators. Study limitations also have to be discussed. First, the intensity and duration of the intervention were not controlled by the researchers since decisions concerning the implementation of the changes were made by the managers. To outline the intensity of the intervention, key informants at the organization identified major changes, taking into account the degree of transformation achieved and employee coverage. To assess the duration of the intervention, activities implemented were systematically documented in logbooks completed in each department. A second limitation might result from the presence of the researchers in the workplace, that is, the Hawthorne effect: were the beneficial effects observed due to the intervention or to the researchers' presence? The latter seems unlikely since the follow-up period continued for two years after the departure of the researchers from the workplace (after the formal intervention period). In addition, any Hawthorn effect that might have resulted from the data collection per se should have acted equally at all three measurements and, therefore, could not explain the changes observed over time. Third, comparison with a control group is not available at this time. It is therefore difficult to establish whether the improvements observed were due to the intervention or to other causes. A comparison with a control group will be done by our study group in the near future. A fourth limitation might be related to the fact that both psychosocial work factors and health outcomes were self-assessed; this might have led to an overestimation of the association (Rothman et al. 2008). However, even when an objective measure of the work environment has already been evaluated (Bosma et al. 1998), self-assessed measures seem more relevant since they rely on the person's appraisal toward their work environment (Siegrist et al. 1996). Since health indicators were self-reported, it is possible that the prevalence figures were overestimated due to specific psychological traits or states of the respondents (e.g., negative affectivity) (Macleod et al. 2001; Watson and Pennebaker, 1989). However, this potential bias would have occurred at all measurement times and thus could hardly explain a significant decrease after the intervention. In addition, the use of two health indicators and the observed decrease in both after the intervention show consistent findings. There are also research findings that indicate that self-assessed health is a better predictor of future health than are objective health measures (Idler and Benyamini 1997). Finally, ambulatory blood pressure, an objective health indicator evaluated in this population, also significantly decreased after the intervention (manuscript in preparation), providing further support for a true improvement of health indicators. Fifth, the global effect of the intervention could have been diluted by the different dynamics and changes that took place in each department. Comparisons between the different departments would help with the interpretation of results of the effectiveness phase. An upcoming paper will investigate this issue. Sixth, the improvement in musculoskeletal disorders prevalence might partly be due to a reduction of postural risk factors. Indeed, an ergonomic program was put in place during the course of the intervention. This program may have reduced postural risk factors such as bad posture and inappropriate position of the computer's screen and keyboard. However, the human resources registrar reported that this program also improved social support. Seventh, the extent to which the results of an intervention study can be generalized might be limited (Rose 1992). However, the fact that the intervention targeted four well-defined, theory-based psychosocial work factors, whose deleterious health effects have been shown in various work settings, favours generalization. Although solutions to improve psychosocial work factors may be specific to each workplace, the process of problem identification and resolution as well as a rigorous evaluation of the intervention effects are exportable. Finally, the qualitative approach made it possible to include the participants' experiences and their views concerning work organization and related changes. However, it might also have provided a somewhat-biased perspective, representative of only those individuals who volunteered to participate. Nevertheless, the reliance on both qualitative and quantitative approaches provided different perspectives on the research and intervention, and helped to compensate for the limitations of any particular methodology. The present intervention study was carried out in a public insurance organization and addressed the three recommended phases of an intervention research: development, implementation and effectiveness. For the development and implementation phases, results were presented for a single department as an illustration of the intervention process that took place in all other departments. These results showed that the changes that were put into effect in this major department were generally consistent with the targeted action priorities. For the effectiveness phase, results were presented for the entire organization. They showed that three psychosocial work factors significantly improved after the intervention (PD, co-worker SS and reward, as shown by respect and esteem). 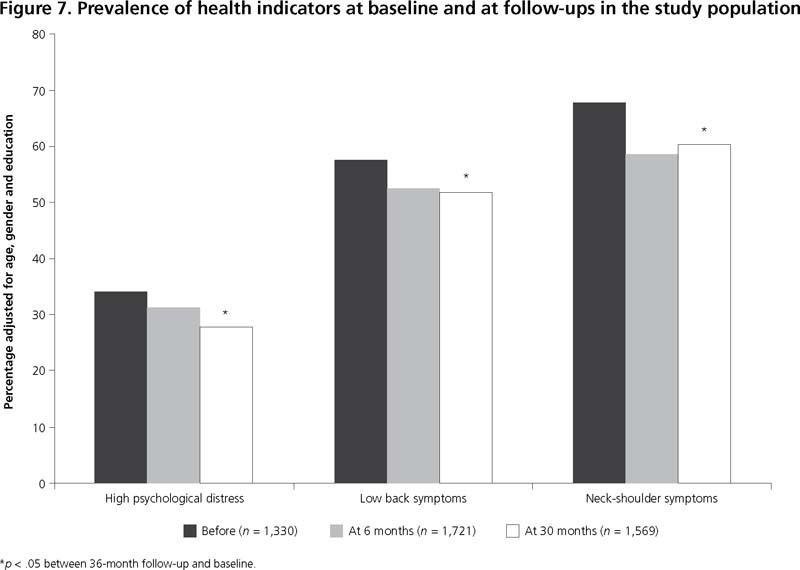 As well, two health indicators improved (prevalence of workers with low back or neck and shoulder symptoms and prevalence of high psychological distress). Short-term beneficial effects observed at six months were maintained at 30 months for both health indicators, and they were intensified for psychological distress. These results suggest that interventions aimed at reducing psychosocial work factors may lead to sizeable improvements in health indicators. The authors wish to thank all of the employees who participated in the study. The authors also wish to thank the Canadian Institutes of Health Research (CIHR) and the National Institute of Occupational Safety and Health, which funded this study. Dr. Brisson held a CIHR scientist award at the time this work was conducted. Dr. Bourbonnais held a Research Investigator award from the Fond de la Recherche en Santé du Québec (FRSQ) at the time this work was conducted. Dr. Dionne holds a senior research scholar from FRSQ. Anderzen, I. and B.B. Arnetz. 2005. "The Impact of a Prospective Survey-Based Workplace Intervention Program on Employee Health, Biologic Stress Markers, and Organizational Productivity." Journal of Occupational and Environmental Medicine 47(7): 671–82. Aronsson, G. 1999. Influence of Worklife on Public Health. Scandinavian Journal of Work and Environmental Health 25: 597–604. Aust, B., R. Peter and J. Siegrist. 1997. "Stress Management in Bus Drivers: A Pilot Study Based on the Model of Effort-Reward Imbalance." Int J Stress Manage 4 (4): 297–305. Bambra, C., M. Egan, S. Thomas, M. Petticrew and M. Whitehead. 2007. "The Psychosocial and Health Effects of Workplace Reorganisation. 2. A Systematic Review of Task Restructuring Interventions." Journal of Epidemiology and Community Health 61: 1028–37. Bureau of Labor Statistics. 2009. Employment, Hours, and Earnings from the Current Employment Statistics Survey (National). Washington: United States Department of Labor. Berkhout, A., N. Boumans, G. Breukelen, H.H. Abu-Saad and F.J.N. Nijhuis. 2004. "Resident-Orientated Care in Nursing Homes: Effects on Nurses." Journal of Advanced Nursing 45: 621–32. Belkic, K. L., P.A. Landsbergis, P.L. Schnall, and D. Baker, D. 2004. "Is Job Strain a Major Source of Cardiovascular Disease Risk?" Scand J Work Environ Health, 30(2): 85-128. Bond, F.W. and D. Bunce. 2001. "Job Control Mediates Change in a Work Reorganization Intervention for Stress Reduction." Journal of Occupational Health Psychology 6: 290–302. Bongers, P.M., S. Ijmker, S. van den Heuvel and B.M. Blatter. 2006. "Epidemiology of Work Related Neck and Upper Limb Problems: Psychosocial and Personal Risk Factors (Part I) and Effective Interventions from a Bio Behavioural Perspective (Part II)." Journal of Occupational Rehabilitation 16: 279–302. Bourbonnais, R., C. Brisson, A. Vinet, M. Vezina, B. Abdous and M. Gaudet. 2006. "Effectiveness of a Participative Intervention on Psychosocial Psychosocial Factors to Prevent Mental Health Problems in a Hospital Setting." Journal of Occupational and Environmental Medicine 63(5): 335–42. Bourbonnais, R., C. Brisson, M. Vézina, B. Mâsse and C. Blanchette. 2005. "Psychosocial Work Environment and Certified Sick Leaves among Nurses during Organizational Changes and Downsizing." Relations Industrielles 60(6): 483–508. Bosma, H, R. Peter, J. Siegrist and M. Marmot. 1998. "Two Alternative Job Stress Models and the Risk of Coronary Heart Disease." American Journal of Public Health 88(1): 68–74. Brisson, C., B. Larocque, J. Moisan, M. Vézina and G.R. Dagenais. 2000. "Psychosocial Factors at Work, Smoking, Sedentary Behavior, and Body Mass Index: A Prevalence Study among 6995 White Collar Workers." Journal of Occupational and Environmental Medicine 42(1): 40–46. Brisson, C., M. Vézina, A. Vinet, L. Trudel, R. Bourbonnais, A. Milot et al. 2001. Intervention Research on Work Organization Factors and Health. Atlanta, GA: Centers for Disease Control and Prevention, National Institute for Occupational Safety and Health. Brisson, C., V. Cantin, B. Larocque, M. Vézina, A. Vinet, L. Trudel et al. 2006. "Intervention Research on Work Organization and Health: Research Design and Preliminary Results on Mental Health." Canadian Journal of Community Mental Health 25(2): 241–59. Brun, J.P. and C. Lamarche. 2006. Évaluation des coÛts du stress au travail, Rapport de recherche, Chaire en gestion de la santé et de la sécurité du travail dans les organisations. Québec, QC: Université Laval. Dahl-Jorgensen, C. and P.O. Saksvik. 2005. "The Impact of Two Organizational Interventions on the Health of Service Sector Workers." International Journal of Health Services 35(3): 529–49. Daveluy, C., L. Pica, N. Audet, R. Courtemanche and F. Lapointe. 2000. Enquête sociale et de santé 1998 (2e éd.). Québec, QC: Institut de la statistique du Québec. Denis, D., M. St.-Vincent, D. Imbeau, C. Jette and I. Nastasia. 2008. "Intervention Practices in Musculoskeletal Disorder Prevention: A Critical Literature Review." Applied Ergonomics 39(1): 1–14. Egan, M., C. Bambra, S. Thomas, M. Petticrew, M. Whitehead and H. Thomson. 2007. "The Psychosocial and Health Effects of Workplace Reorganisation. 1. A Systematic Review of Organisational-Level Interventions That Aim to Increase Employee Control." Journal of Epidemiology and Community Health 61: 945–54. Eklof, M. and M. Hagberg. 2006. "Are Simple Feedback Interventions Involving Workplace Data Associated with Better Working Environment and Health? A Cluster Randomized Controlled Study among Swedish VDU Workers." Applied Ergonomics 37(2): 201–10. Fredriksson, K., C. Bildt, G. Hagg and A. Kilbom. 2001. "The Impact on Musculoskeletal Disorders of Changing Physical and Psychosocial Work Environment Conditions in the Automobile Industry." International Journal of Industrial Ergonomics 28: 31–45. Gilbert-Ouimet, M., G. Baril-Gingras, C. Brisson, V. Cantin, I. Leroux, M. Vézina et al. In review. The Content of a Psychosocial Work Environment Preventive Intervention. Manuscript submitted for publication. Goldenhar, L.M., A.D. LaMontagne, T. Katz, C. Heaney and P. Landsbergis. 2001. "The Intervention Research Process in Occupational Safety and Health: An Overview from the National Occupational Research Agenda Intervention Effectiveness Research Team." Journal of Occupational and Environmental Medicine 43(7): 616–22. Honkonen, T., M. Virtanen, K. Ahola, M. Kivimäki, S. Pirkola, E. Isometsä et al. 2007. "Employment Status, Mental Disorders and Service Use in the Working Age Population." Scandinavian Journal of Work, Environment and Health 33(1): 29–36. Idler, E. and Y. Benyamini, Y. 1997. "Self-Rated Health and Mortality: A Review of Twenty-Seven Community Studies." Journal of Health and Social Behavior 38: 21–37. Ilfeld, F.W. 1976. "Further Validation of a Psychiatric Symptom Index in a Normal Population." Psychological Reports 39: 1215–28. Jackson, P. and S. Mullarky. 2000. "Lean Production Teams and Health in Garment Manufacture." Journal of Occupational Psychology 2: 231–45. Järvisalo, J., B. Andersson, W. Boedeker and I. Houtman. 2005. Mental Disorders as a Major Challenge in Prevention of Work Disability. Experiences in Finland, Germany, the Netherlands and Sweden (Social Security and Health Report No. 66). Helsinki, Finland: The Social Insurance Institution of Finland. Johnson, J.V., E.M. Hall and T. Theorell. 1989. "Combined Effects of Job Strain and Social Isolation on Cardiovascular Disease Morbidity and Mortality in a Random Sample of the Swedish Male Working Population." Scandinavian Journal of Work, Environment and Health 15: 271–79. Karasek, R. 1979. "Job Demands, Job Decision Latitude, and Mental Strain: Implications for Job Redesign." Administrative Science Quarterly 24: 285–308. Karasek, R.A. and T. Theorell. 1990. Healthy Work: Stress, Productivity, and the Reconstruction of Working Life. New York: Basic Books Publishers. Karsh, B.T., F.B.P. Moro and M.J. Smith. 2001. "The Efficacy of Workplace Ergonomic Interventions to Control Musculoskeletal Disorders: A Critical Analysis of the Peer-Reviewed Literature." Theoretical Issues in Ergonomics Science 2(1): 23–96. Karttunen, A. 1995. All Worked Up. Helsinki, Finland: Work Health Safety, Institute of Occupational Health. Kauffeld, S., E. Jonas and D. Frey. 2004. "Effects of a Flexible Work-Time Design on Employee- and Company-Related Aims." European Journal of Work and Organizational Psychology 13(1): 79–100. Kawakami, N., Y. Kobayashi, S. Takao and A. Tsutsumi. 2005. "Effects of Web-Based Supervisor Training on Supervisor Support and Psychological Distress among Workers: A Randomized Controlled Trial." Preventive Medicine 41(2): 471–78. Kompier, M. and T. Kristensen. 2000. "Organizational Work Stress Interventions in a Theoretical, Methodological and Practical Context." In J. Dunham, ed., Stress in the Workplace: Past, Present and Future. London: Whurr Publishers. Kompier, M.A.J., S.A.E. Geurts, R.W.M. Gründemann, P. Vink and P.G.W. Smulders. 1998. "Cases in Stress Prevention: The Success of a Participative and Stepwise Approach." Stress Medicine 14: 155–68. Kristensen, T.S. 2005. "Intervention Studies in Occupational Epidemiology." Occupational and Environmental Medicine 62(3): 205–10. Kuorinka, I., B. Jonsson, A. Kilbom, H. Vinterberg, F. Biering-S⊘rensen, G. Andersson et al. 1987. "Standardised Nordic Questionnaires for the Analysis of Musculoskeletal Symptoms." Applied Ergonomics 18(3): 233–37. Larocque, B., C. Brisson and C. Blanchette. 1998. "Cohérence interne, validité factorielle et validité discriminante de la traduction française des échelles de demande psychologique et de latitude décisionnelle du 'Job Content Questionnaire' de Karasek." Revue d'Epidémiologie et de Santé Publique 46: 371–81. Lavoie-Tremblay, M., R. Bourbonnais, C. Viens, M. Vézina, O.J. Durand and L. Rochette. 2004. "Improving the Psychosocial Work Environment." Journal of Advanced Nursing 49(6): 655–64. Lawrence, R.C., C.G. Helmick, F.C. Arnett, R.A. Deyo, D.T. Felson, E.H. Giannini et al. 1998. "Estimates of the Prevalence of Arthritis and Selected Musculoskeletal Disorders in the United States." Arthritis and Rheumatism 41: 778–99. L'Écuyer, R. 1987. "L'analyse de contenu: notion et étapes." In J.P. Deslauriers, ed., Les méthodes de la recherche qualitative. Québec, QC: Presses de l'Université du Québec. L'Écuyer, R. 1990. Méthodologie de l'analyse développementale de contenu. Québec, QC: Les Presses de l'Université du Québec. Logan, M.S. and D.C. Ganster. 2005. "An Experimental Evaluation of a Control Intervention to Alleviate Job-Related Stress." Journal of Management 31(1): 90–107. Macleod, J., G. Davey Smith, P. Heslop, C. Metcalfe, D. Carroll and C. Hart. 2001. "Are the Effects of Psychosocial Exposures Attributable to Confounding? Evidence from a Prospective Observational Study on Psychological Stress and Mortality." Journal of Epidemiology and Community Health 55: 878–84. Michie, S., B. Wren and S. Williams. 2004. "Reducing Absenteeism in Hospital Cleaning Staff: Pilot of a Theory Based Intervention." Occupational and Environmental Medicine 61: 345–49. Mikkelsen, A. and M. Gundersen. 2003. "The Effect of a Participatory Organizational Intervention on Work Environment, Job Stress, and Subjective Health Complaints." International Journal of Stress Management 10(2): 91–110. Mikkelsen, A., P.⊘. Saksvik and P. Landsbergis. 2000. "The Impact of a Participatory Organizational Intervention on Job Stress in Community Health Care Institutions." Work and Stress 14: 156–70. National Center for Health Statistics. 2007. With Chartbook on Trends in the Health of Americans. Hyattsville, Maryland: Author. National Institute of Mental Health. 2008. The Numbers Count: Mental Disorders in America. Bethesda, MD: Author. Retrieved February 14, 2008. <www.nimh.nih.gov/health/publications/the-numberscount-mental-disorders-in-america.shtml>. National Research Council and Institute of Medicine. 2001. Musculoskeletal Disorders and the Workplace: Low Back and Upper Extremities. Washington DC: National Academy Press. Niedhammer, I. 2002. "Psychometric Properties of the French Version of the Karasek Job Content Questionnaire: A Study of the Scales of Decision Latitude, Psychological Demands, Social Support, and Physical Demands in the GAZEL Cohort." International Archives of Occupational and Environmental Health 75(3): 129–44. Niedhammer, I., I. Bugel, M. Goldberg, A. Leclerc and A. Guéguen. 1998. "Psychosocial Factors at Work and Sickness Absence in the Gazel Cohort: A Prospective Study." Occupational and Environmental Medicine 55: 735–41. Niedhammer, I., J. Siegrist, M.F. Landre, M. Goldberg and A. Leclerc. 2000. "Étude des qualités psychométriques de la version française du modèle du Déséquilibre Efforts/Récompenses." Revue d'Epidémiologie et de Santé Publique 48: 419–37. Ouellet, F. 1887. L'utilisation du groupe nominal dans l'analyse des besoins. Les méthodes de recherche qualitatives. Sillery: Presses de l'Université du Québec.. p. 67-80. Parent-Thirion, A., E. Fernández Macías, J. Hurley and G. Vermeylen. 2007. Fourth European Working Conditions Survey. Dublin, Ireland: European Foundation for the Improvement of Living and Working Conditions. Park, K.O., B.S. Schaffer, C.S. Griffin-Blake, D.M. Dejoy, M.G. Wilson and R.J. Vandenberg. 2004. "Effectiveness of a Healthy Work Organization Intervention: Ethnic Group Differences." Journal of Occupational and Environmental Medicine 46: 623–34. Parker, S. 2003. "Longitudinal Effects of Lean Production on Employee Outcomes and the Mediating Role of Work Characteristics." Journal of Applied Psychology 88: 620–34. Pope, D.P., C. Croft, C. Pritchard and A. Silman. 1997. "Prevalence of Shoulder Pain in the Community: The Influence of Case Definition." Annals of Rheumatic Disease 56: 308–12. Préville, M., R. Boyer, L. Potvin, C. Perreault and G. Légaré. 1992. La détresse psychologique: détermination de la fiabilité et de la validité de la mesure utilisée dans l'enquête Santé Québec (No. 54, Vol. 7). Montréal, QC: Santé Québec. Rose, G.1992. The Strategy of Preventive Medicine. Oxford, England: Oxford University Press. Rothman, K., S. Greenland and T.L. Lash. 2008. Modern Epidemiology. Philadelphia: Lippincott-Raven Publisher. Ryan, P., R. Hill, M. Anczewska, P. Hardy, A. Kurek, K. Nielson et al; Oscar Group. 2005. "Team-Based Occupational Stress Reduction: A European Overview from the Perspective of the OSCAR Project." International Review of Psychiatry 17(5): 401–08. Sanderson, K. and G. Andrews. 2006. "Common Mental Disorders in the Workforce: Recent Findings from Descriptive and Social Epidemiology." Canadian Journal of Psychiatry 51(2): 63–75. Santé Québec. 1989. Et la santé, ça va? Rapport de l'enquête de 1987. Québec, QC: Gouvernement du Québec, Ministère de la santé et des services sociaux. Semmer, N.K. 2006. "Job Stress Interventions and the Organization of Work." Scandinavian Journal of Work, Environment and Health 32: 515–27. Siegrist, J. 1996. "Adverse Health Effects of High-Effort/Low-Reward Conditions." Journal of Occupational Health Psychology 1(1): 27–41. Siegrist, J. 2003. The Model of Effort-Reward Imbalance: Measurement. Dusseldorf, Germany: Heinrich-Heine-University Dusseldorf. Retrieved September 12, 2006. <http://www.uni-duesseldorf.de/MedicalSociology/index-eri.htm>. Siegrist, J., D. Starke, T. Chandola, I. Godin, M. Marmot and I. Niedhammer. 2004. "The Measurement of Effort-Reward Imbalance at Work: European Comparisons." Social Science and Medicine 58: 1483–99. Silverstein, B. and R. Clark. 2004. "Interventions to Reduce Work-Related Musculoskeletal Disorders." J Electromyogr Kinesiol 14 (1): 135–52. Sluiter, J.K., A.P. Bos, D. Tol, M. Calff, M. Krijnen and M.H. Frings-Dresen. 2005. "Is Staff Well-Being and Communication Enhanced by Multidisciplinary Work Shift Evaluations?" Intensive Care Medicine 31(10): 1409–14. Stansfeld, S. and B. Candy. 2006. "Psychosocial Work Environment and Mental Health – A Meta-analytic Review." Scandinavian Journal of Work, Environment and Health 32: 443–62. Statistics Canada. 2005. Canadian Community Health Survey. Ottawa, ON: Author. Theorell, T., R. Emdad, B. Arnetz and A.M. Weingarten. 2001. "Employee Effects of Educational Program for Managers at an Insurance Company." Psychosomatic Medicine 63: 724–33. Vézina, M., R. Bourbonnais and C. Brisson. 2006. "Définir les risques : sur la prévention des problèmes de santé mentale." Actes de la recherche en science sociale 163. Vinet, A. 2004. Travail, organisation et santé: le défi de la productivité dans le respect des personnes. Québec, QC: Presses de l'Université Laval. Wahlstedt, K., C. Nygard, K. Kemmlert, M. Torgén and M.G. Björkstén. 2000. "The Effects of a Change in Work Organisation upon the Work Environment and Musculoskeletal Symptoms among Letter. Carriers." International Journal of Occupational Safety and Ergonomics 2: 237–55. Watson, D. and J.W. Pennebaker. 1989. "Health Complaints, Stress, and Distress: Exploring the Central Role of Negative Affectivity." Psychological Review 96: 234–54. Weyers, S., R. Peter, H. Boggild, H.J. Jeppesen and J. Siegrist. 2006. "Psychosocial Work Stress Is Associated with Poor Self-Rated Health in Danish Nurses: A Test of the Effort-Reward Imbalance Model." Scandinavian Journal of Caring Sciences 20: 26–34. Zeger, S.L. and K.Y. Liang. 1986. "Longitudinal Data Analysis for Discrete and Continuous Outcomes." Biometrics 42(1): 121–30.